William Gibbs McAdoo lived in Chattanooga for 10 years. When William Gibbs McAdoo stepped down from his position as secretary of the treasury in 1919, President Woodrow Wilson expressed his keen regret over losing the "distinguished, disinterested and altogether admirable service you have rendered this country." The role that Chattanooga played in giving a start to this "World war cabinet officer, former senator, and distinguished in law, finance and shipping" is little known. McAdoo was born near Marietta, Ga., shortly before Gen. William T. Sherman's army swept across the McAdoo farm and left the family in "biting poverty." Growing up in Milledgeville, he and his siblings were "always illy clad, inadequately covered, shivering in wretchedness." Reconstruction, he wrote, "was a nightmare of misgovernment, carpet-baggers, unheard-of-taxes, swarms of idle negroes and discouraged white men. The land was filled with low rascals who had come from the North to make their fortunes." The elder McAdoo was judge, educator and Confederate soldier, and his wife was a talented writer. Philip M. Chase's doctoral dissertation in 2008 pointed out that the father had high hopes for his fourth son and required him to practice declamation and debate for hours at a time and to memorize melodramatic poetry. After his father joined the faculty at the University of Tennessee, young William entered its law school but left before graduating to earn living expenses as a court clerk. He came to Chattanooga in 1882 to be deputy clerk for the federal district court. During his 10 years in Chattanooga, he first shared an office with John T. Lupton, also a promising attorney, who abandoned law for Coca-Cola bottling, and then formed a partnership with another young lawyer, J.H. Barr. He quickly made a wide circle of friends. One was Sarah Hazelhurst Fleming. When the two married at St. Paul's Episcopal Church in 1885 , the Times reported that "The church was brilliantly illuminated. Besides all the gas jets, fully fifty tapers were lighted. Beautiful plants were placed upon and around the altar and lovely flowers and plants were in the nave in great profusion. When the bridal party reached the church, the organ pealed an anthem and the male chorus, numbering twenty, all attired in white cassocks, proceeded up the aisle in twos, chanting the hymn." In "Chattanooga's Story," John Wilson wrote "Chattanoogans found McAdoo to be a very genial, lovable young fellow with a liking for hard work. He was a live wire who made friends easily and kept them." In 1887 McAdoo made a trip to Ohio to induce manufacturing firms to come south for opportunities in Chattanooga. Soon officials of a large mower and reaper works moved to the city's Central Avenue. McAdoo left Chattanooga in 1892 for Knoxville in an unsuccessful attempt to electrify its street car system. He then moved to New York City, where he joined Francis R. Pemberton, son of Confederate Gen. John C. Pemberton, to form Pemberton and McAdoo, selling investment securities. After a second streetcar failure in Knoxville, the ambitious young lawyer returned in 1897 to New York City, where he led an effort to build a railway tunnel under the Hudson River connecting Manhattan with New Jersey. In 1908 the popular president of the Hudson and Manhattan Railroad oversaw the opening of the two "McAdoo tubes," now part of the PATH rapid transit system. His railroad's motto was "Let the public be pleased." At the Democratic Convention in Baltimore in 1912, Vice-Chairman McAdoo promoted Woodrow Wilson for the presidency. Wilson won the top office and appointed McAdoo secretary of the treasury. After Congress established the Federal Reserve System in December 1913, the secretary oversaw the development of the central bank as its first chairman (ex officio). When the war broke out in Europe, British and French investors began to liquidate their American securities, convert them to gold and repatriate their holdings to Europe, thus weakening the U.S. dollar. McAdoo boldly closed the New York Stock Exchange for four months. NYU economist William Silber wrote in 2007 in "When Washington Shut Down Wall Street," that the treasury secretary averted a panic and collapse of the American financial system in the early stages of the war and laid the groundwork for a decisive shift in the balance of power from Europe to the U.S. 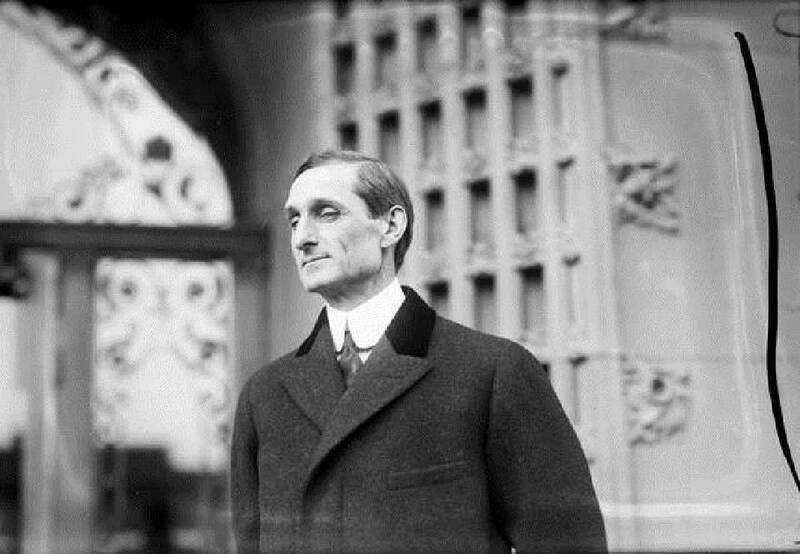 The federal government took over the operations of the nation's disjointed railroads during the war emergency, and President Wilson appointed the McAdoo to an additional position as director general of the railroads. Frank (Mickey) Robbins is an investment adviser with Patten and Patten. For more visit Chattahistoricalassoc.org.